Commercial Potato Farming is not an easy thing to do whether you’re doing it organically or non-organically. The non-organic potato farmer is pressured into producing a perfect, blemish-free tuber for the French fry market. To get this cosmetically perfect potato, these farmers have resorted to the heavy use of pesticides, herbicides, and fumigants. The result is a chemically laden food product which isn’t safe to eat (in my opinion) and isn’t that nutritious. It’s not easier for the organic potato farmer either. The organic farmer must know entomology, biology, botany, ecology and in-depth knowledge of plant material. Both organic and non-organic farmers have the same challenges. To combat these challenges, the non-organic potato farmer uses chemicals and GMOs (Genetically Modified Organisms), and the organic potato farmer uses safe inputs, nature, and planned and built-in biological systems. Let’s look at how non-organic and organic potatoes are grown. The season starts off with a soil fumigant to control nematodes (micro-sized roundworm soil pest) and certain diseases in the soil. This fumigant is so strong it kills every trace of microbial life in the soil. When you’re working with dead soil, the nutrient density or nutrient value of the vegetable is very low. Next, an herbicide is placed on the soil – Lexone, Sencor or Eptam to clean the fields of all weeds. At planting, a systemic insecticide, such as Thimet, is used. Systemic Insecticides are absorbed by the young seedling and will kill any insect that eats their leaves for several weeks. When the potato plants are six inches tall, a second herbicide is sprayed on the field to control weeds. A typical potato field receives 10 weekly sprayings of chemical fertilizer. Just before the leaves of one row start to touch the leaves of another row the field is sprayed with Bravo, a fungicide that controls late blight a deadly potato fungus. The field is again sprayed with a crop duster, on fourteen-day intervals, to control aphids. Aphids can transmit leafroll virus, which causes a brown spot (a fungus that causes brown leaf spot), a cosmetic defect only. This pesticide is justified because consumers don’t want to see brown spots on their French fries. Some of the most toxic chemicals in use are used, such as an organophosphate pesticide called Monitor. Monitor is a deadly chemical. It is known to damage the human nervous system. A farmer or any two or four-legged creature are prohibited from going into a field that has been sprayed with Monitor for four or five days. If the farmer is using a GMO Potato, such as “NewLeaf,” by Monsanto, the above chemical applications can be cut in half. These GMO potatoes have a Bt gene that provides resistance to the Colorado Potato Beetle. 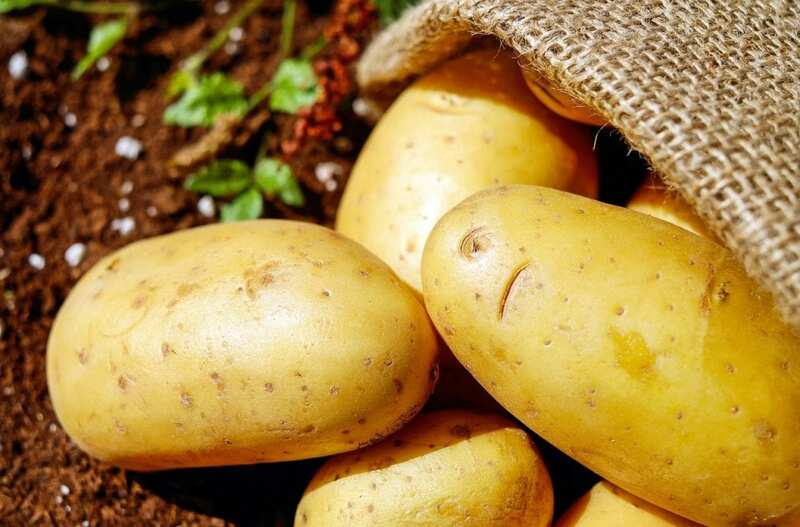 Yes, these GMO Potatoes have in their genes a soil fungus called Bacillus thuringiensis, a soil-dwelling bacterium, commonly used as an organic biological pesticide. Can you eat the Potatoes out of the field anytime? Long and complex crop rotations (growing different crop species in the same field) are used to prevent a buildup of crop-specific pests and disease. Typically potatoes see the same field once every five years. Planting Wheat, for example, after a season of potatoes “confuses” the potato beetles, which prevents pest build-up. Intercropping is the agricultural practice of cultivating two or more crops in the same space at the same time. Farmers may plant flowering crops on the margins of the potato fields such as peas or alfalfa, to attract the beneficial insects that eat beetle larvae and aphids. If there aren’t enough beneficial insects to do the job, ladybugs will be introduced.Organic potato farmers may grow up to eight varieties of potatoes together, to increase biodiversity in a field. Biodiversity in a field mimics natural systems and is the best protection against any pest and disease imbalances. This is also insurance against a bad year with one variety as it will possibly be offset by a better year with the others. Natural fertilizers (compost and fish powder) are used. Copper spray is used. Copper spray is a safe organic fungicide. Outside (brought from outside the farm) pest control inputs are ladybugs. Which Potato Will You Eat? 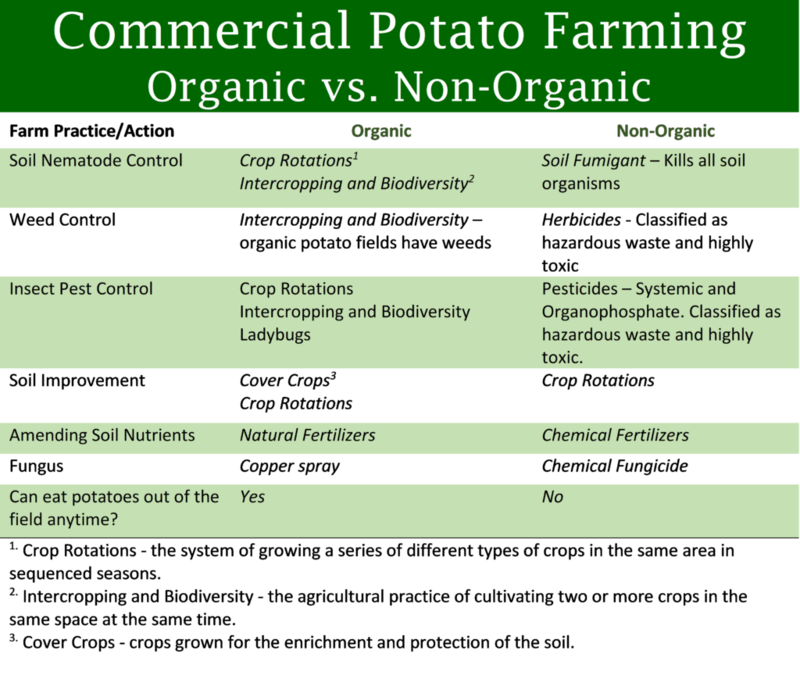 If one non-organic potato farmer won’t eat his farmed potatoes… WHY SHOULD WE?